Feliway (Comfort Zone and CEVA) is a synthetically created pheromone for in-house use to calm down nervous and stressful cats. Feliway can help against stressful urinating cats. Feliway can be used for a number of different purposes and comes in a variety of product types. Although Feliway products don’t work on all cats, for those that it does work with, it really calms down nerves for them. It has been proven to be effective in common behavioral problems with cats at home. 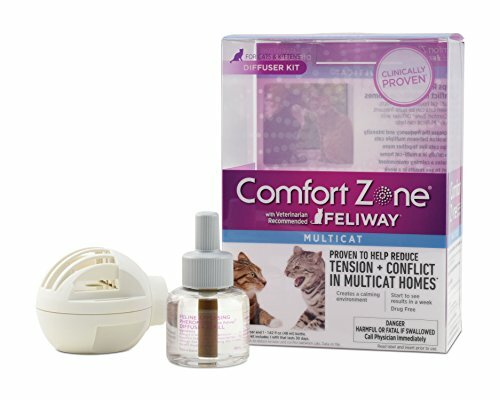 Feliway (Comfort Zone and CEVA) is a synthetically created pheramone for inhouse use to calm down nervous and stressful cats. Feliway can help against stressful urinating cats and many other multi-cat problems. A very effective tool against in-house problems! Ever had problems with a cat that sprays in your house? Problems with a cat urinating outside the litter box? Have problems with a cat that doesn’t like changes around your house, for example when you change furniture around or when visitors come to you? Got a cat that is scared and hides behind furniture as soon as you enter the room? Perhaps your cat doesn’t eat enough or feels stressed with every sound in the house. There are many reasons that cats have this behavior. For one it can be a medical condition, which always should be figured out first about. But in many cases, this are stress related issues that can be solved with some simple measures. Whenever they come across their own pheromones, they will feel at home or at peace. It will calm them down naturally. But in big multi-cat environments, they might be smelling other cat’s pheromones making them nervous or anxious. Feliway is a synthetic created pheromone that is of a neutral scent. It is simulating to be neutral or their own, and not a “get out of here, I live here this is my property and not yours“. The most common and well-known version is a plug-in diffuser. You put the diffuser upright in an electrical socket outlet in your house. In the diffuser is a bottle that has the pheromone product in it. By heating up, the diffuser spreads the neutral and calming pheromone through the room. We humans are unable to smell it, but your cat will notice it. In most of the cases your cat will calm down and relax a bit more. Things might come to peace again at home. We got a very anxious cat from the animal protection that is really scared. 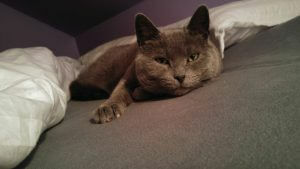 She calms down tremendously around us since the use of Feliway. Generally all our cats are more at peace now that we got Feliway diffusers installed in our house. We got 8 cats in total, so you can imagine how busy it is at times. They have had their arguments, but nowadays they got none. Our boy cat Tiger has always been a spraying and marking guy around and in the house. It is really frustrating to have cleaned the entire house, only to find some piss against a sofa the next moment. He hasn’t stopped entirely, because he is just the way he is, but it has reduced the behavior big time. The problem with him is that he also goes outside and gets outside stress from other cats in the neighborhood. And the diffusers are not outside. The cats responsible for scratching our furniture have reduced their furniture scratching behavior and instead done this on the scratching furniture that is designed for this. To train your cat to use the type of equipment that is meant for scratching and sharpening nails, you can also buy the Feliway Spray. It is supposed to be sprayed upon the scratching pole and not on the furniture you want to keep nice. The wipes are there for the traveling cat. The wipes are used on/in the cat box to ease and calm down your cat for traveling. Traveling is in most cases an extra added stress to cats, whether you are going to the veterinarian clinic with your cat or whether it is a (weekend)holiday trip, doesn’t matter. There is also a cat collar from another brand that gives the cat a calming scent of neutral pheromones while your cat is spending time outside. It comes with a safety release breakaway system, so that your cat doesn’t get stuck with their new collar. Measured effect after 3-7 days. It doesn’t work for all cats, some do not respond to it, but most do. The Feliway plug-in diffuser as well as the other products of Feliway are in most cases very effective against cat stress, anxiety and unwanted behavior. The diffuser is the best solution for indoor cat problems, while the wipes and spray can be used as well for traveling. Unwanted behavior such as scratching, biting and urinating, can in most cases be resolved by using Feliway Diffuser or Feliway Spray. It does however not guarantee it works on every cat. We have had a lot of success with the products in our house. We use the diffusers actively in our house of eight cats and have also gotten the spray to help with the transporting of cats. We would really recommend it to anyone with the mentioned problems with their cat(s)! This is the first time I am hearing about Feliway products. Our cat Wesley is as cool as a cucumber at home, but he turns into a raving lunatic at the vet’s office. I swear it is a Jeckyl and Hyde situation. He becomes like a cross between a Tasmanian Devil and the Terminator. He can’t be reasoned with and will kill anything that tries to get close to him. Would this diffuser help Wesley with his vet issues, or is there another product in the Feliway line that might help? Haha you got some typical cat right there, even though he is wild and crazy at the vet. Cats are not big fans of going for trips in the car or visits to the veterinary. It would be the same as taking a kid to the dentist I think. Vets want to fiddle with their bodies or put painful injections into them. No, I have not much advice as to how to calm them before a veterinary visit, other then to make sure to not do any wild activities right before it. The Feliway is for nervous cats however, so it might work for your cat to some extend. Another producer has made a collar that you can put on your cat. With a collar, your cat can be calm wherever it goes, even at the vet! They also have a spray for those that need to travel. You can puff a few sprays of the Feliway Travel Spray into the travel box, before you put your cat Wesley into it, which can further help with calming your cat down for travel and veterinary examination. I find this article very interesting because a couple of the issues you described is the behavior my cat has. When we decided to change her food and water bowl around to a different location in the house she refused to eat. So we had to put the bowls back so she’ll eat. We also bought a cat scratcher to keep her from scratching the furniture but she still continued to scratch the furniture and walls. She never bothered with the cat scratcher. I never thought these issues were due to stress. I think the plug-in diffuser would possibly be our big help. 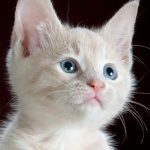 Your article gives a lot of information and explains it to help us understand cat’s behavior problem and what to do to help them. Thank you for sharing this article. I’m bookmarking this page and share it with others. I understand how annoying this problem is. We also have had a lot of problems with wall and furniture scratching as well as urinating outside the litter box due to stress. Since we installed a Feliway Diffuser in our living room, all these problems seem to have gone away. Thank you for your comment and I hope to see you again! Interesting article on cat habits and products, this is all new to me I never owned a cat always been a dog person. Interesting how this product can calm your cat and solve many of the nasty problems you shared in your article, I never knew cats could experience such problems. I was just wondering what does this scent smell like to people? Yes CEVA Comfort Zone Feliway Diffuser is solely for cats, but a similar product also exists for dogs. It is called Comfort Zone Adaptil Diffuser Kit and is also for sale on Amazon. It could calm down your dog during thunderstorms or firework displays outside. 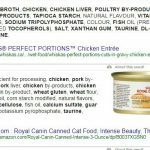 As with all types of medicine and products for cats and dogs, they do work on most or some and not on all. You will have to test out what product works best on your dog if you are interested.